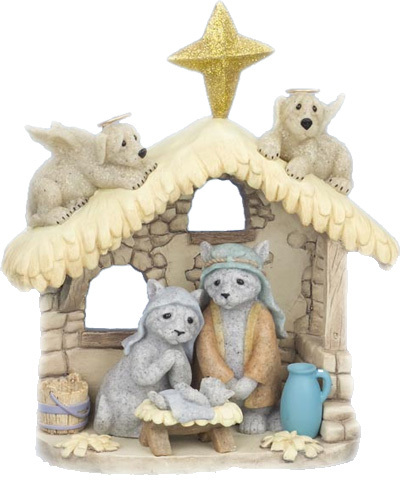 Here is a fine example of the Really Depressed Animal nativity genre. The look on cat-Mary’s face is all too familiar; it usually means that there is only sad, dry cat food in the bowl. Also…why are the angels dogs? This entry was posted in inter-species on December 6, 2007 by admin. And Baby Jesus looks remarkably like a corpse. No wonder Mary and Joseph look so mournful. Their poor blue baby died! The angels are dogs because “all dogs go to heaven” of course. LOVE that all dogs comment! Yes, I believe it looks like rigamortis has set in on baby kitty JC. It looks like he is laying on a bed of banana peels. Damn, I love this stuff. Can Mary and Joseph Kitties go on some prozac? This is scary! I don’t think I’ve seen more pathetic looking cats. Sorry to double post, but I’ve submitted a comment & a link to the Cavalcade in the Times’ site. I hope it brings more attention to this fine blog! Why are the angels dogs?? Honey, could you pick up some more formula and Holy Sh*t cat litter when you’re at the store?